Hexagon. Your shape is so symmetrical, I am thankful for your order in an un-orderly world. I am thankful for you! Six Sided Sampler in In-Colors 2014-16: Lost Lagoon, Mossy Meadow, and Blackberry Bliss; on a Blackberry cardstock base with a Whisper White layer. The sentiment, from the soon-to-be-released special set for party hosts, is one of the Good Greetings. 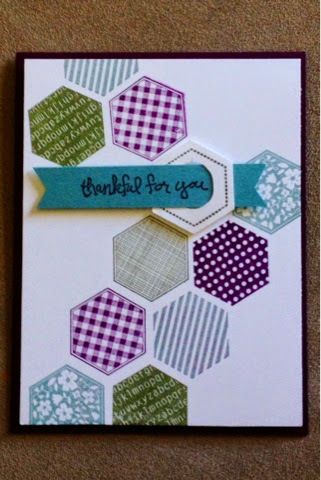 I liked the use of the banner through the punched hexagon, and it works perfectly with these sentiments because of their smaller size. Card CASEd from Fran Sabads layout last year. Two-for Tuesday comin' atcha!! Check back this afternoon!